A lot of you liked this post wherein I shared some data about which industries might be hiring. So, again, I want to do what I did there and rip off someone else’s chart to give you some data. This time, we’re looking backward. 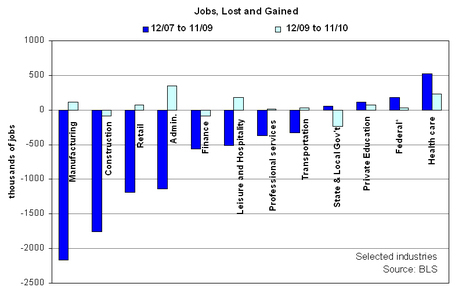 So far in this recession, which industries shed jobs and which industries gained them? Also, where are we in terms of ending this horrible job market? We Lost 8 Million Jobs. Only 1 Million Came Back. What is my takeaway from all this? Times are good? We lose manufacturing jobs. Times are bad? We lose tons more manufacturing jobs. Basically: do we have any manufacturing jobs left? Construction got socked. We knew that. It was a bubble industry and it popped. But it looks like once those jobs were gone, there wasn’t extended bleeding. Things are returning to normal? If you are in government, you weathered the beginning of the recession well, but you’re getting killed now. State and local govt. especially. Finance is still losing jobs. Not as bad, but still. That sector is not healthy yet. Hospitality lost jobs like they do every recession, but that has bounced back nicely. Finally, my big takeaway mimics what the headline of the article says: we’re still sitting at the bottom. What I mean is, we lost all these jobs. All at once. And we’re not losing them as badly. In fact, in some places we’re clawing back. But nowhere, and I mean nowhere, are we recovering the ground we’ve lost. Not in any meaningful way, at least. In fact, you want a non-silver lining? Look at health care. It’s the only place we were adding jobs early on, and are still adding jobs now. But not as quickly. So what does it say for our economy when the only growth area is slowing down hiring? If all you can say is that we’re not bleeding anymore, that’s fine. But when do we recover? I see no signs of getting all those jobs we lost back any time soon. Is A Recession Any Time To Ask For A Raise? But are these only considering full-time jobs? There’s been a shift, in some industries, from full-time to contract/temporary work. That might account for some of the jobs that ‘haven’t come back’, in that they’re coming back in other forms.